People who know me personally know that I’m one of the uncoolest people around. However, a lack of eye-hand coordination has rendered me useless at video games, so rather than spending all my time at home punching buttons to blast digital monsters, I spend it observing the habits and activities of people who are cool. Somehow, I always managed to find out where all the parties were, even though no one invited me inside. I wanted to know what I was missing. 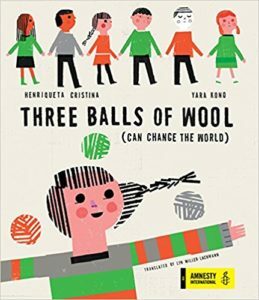 And I can tell you all about those parties in great detail, with a keen outsider’s perspective. One of our favorite restaurants in the Corpo Santo neighborhood is Casa de Pasto, which opened in 2014. In the three years since Trendsetter and Hipster’s visit to Lisbon — the prenuptial honeymoon that ended their relationship and sent Trendsetter back to living with her parents — Lisbon has become a major tourist destination. Some of the neighborhoods that hosted earlier waves of hip tourists have now gone mainstream, as evidenced by the lines of tuk-tuks waiting to ferry travelers through their narrow streets. Most of the stores and restaurants in those neighborhoods — thinking of you, Alfama and Mouraria! — cater to tourists, with mass-produced souvenirs and “typical” Portuguese dishes. 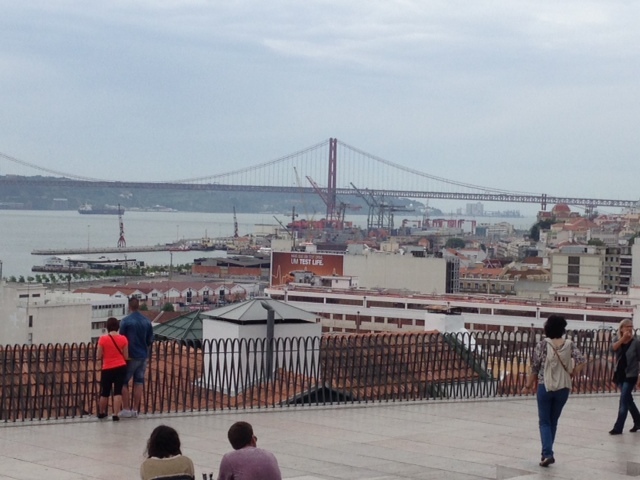 They’re still worth the trip, because visitors get a sense of how working-class Lisboetas lived years ago, with the narrow streets, stairs, and whitewashed buildings with tile roofs. There are also some great museums in Alfama and Mouraria, including the Museu Nacional do Azulejo (featuring the decorative ceramic tiles), the Museu do Fado (dedicated to the uniquely Portuguese musical genre), the National Pantheon, the iconic Castelo São Jorge, the Museum of Resistance and Liberation in the former Aljube Prison in Mouraria, the National Cathedral across the street, and the excavation of Roman ruins throughout the Santa Maria de Maior area that covers the lower part of both neighborhoods. 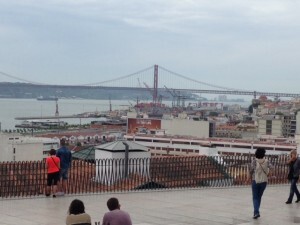 View of the Rio Tejo and the 25th of April Bridge from the Miradouro Santa Caterina. So what are the new up-and-coming neighborhoods, where young, hip tourists can chill at lively bars, dine in innovative restaurants, and shop at stores featuring emerging artists and designers? Since yesterday’s hip becomes today’s staid, Richard and I spent a lot of time checking out the recently arrived. As of mid-2017, we’d call Corpo Santo the #1 hipster neighborhood in Lisbon. 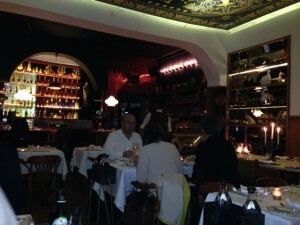 It’s just west of Baixa and parallel to the Cais de Sodré, starting at the waterfront and heading up the hill. Here you will find the upscale Time Out food court in the Mercado da Ribeira (which we think has lost a step), and a couple of blocks away the newest member of the Chef Kiko empire, O Watt, in the headquarters of the electric company EDP (hence its name). The once-seedy Praça de São Paulo is now a hopping night spot with multiple bars and the brand-new and constantly crowded Gelato Davvero (where the ice cream is decent but we still prefer Nannarella). This used to be an area of warehouses and working-class bars — in my hopefully-to-be-published-one-day novel, there’s a dead-end underpass where my protagonist meets her ride to a clandestine school during the dictatorship — but in 2017 it was the fastest-gentrifying neighborhood of Lisbon. View of the street and ever-popular 28 tram route from the edge of the Santa Catarina-Bica neighborhood. Keep going uphill from Corpo Santo to find hipster neighborhood #2, Santa Catarina-Bica. We stayed in this neighborhood in 2014. There are a lot of youth hostels here, and the nabe features one of the nicest lookouts in the city, with a front-row view of the 25th of April Bridge. It has great street life, and the bars and kiosks typically serve revelers early in the evening, as around midnight they roll down the hill to the bars in Corpo Santo and neighboring Baixa. On the northern edge of Santa Catarina-Bica, along the Calçada do Combro, a lot of diverse new shops are opening up, selling everything from designer furniture to textiles to books. The 28 streetcar, best known for its Alfama stops and its pickpockets, crosses downtown and travels west along Calçada do Combro to the National Assembly building. Here, the streetcar isn’t quite as crowded, making this neighborhood a good place to climb aboard and travel cross-town. The part closest to the National Assembly, where we looked at a house under construction, still hasn’t up-and-come, but I expect that area to gentrify soon, as it’s also close to the upscale Principe Real neighborhood. East of Corpo Santo, along the Rua do Alecrim and its parallel streets running from the waterfront to the Largo de Camões to the west and the Armazens do Chiado mall to the east, are the Baixa and Chiado neighborhoods. This is the historic cultural center of the city, with the Teatro São Luiz and the Belas Artes school affiliated with the University of Lisbon. In recent years, Chiado, the area at the top of the hill, has seen the opening of new galleries and the Contemporary Art Museum, while Baixa, closer to the waterfront, is a destination for innovative bars and restaurants. Baixa especially has undergone major construction and renovation in the past few years, while Chiado has shed some of its stereotypically touristy reputation, making this area hipster neighborhood #3. 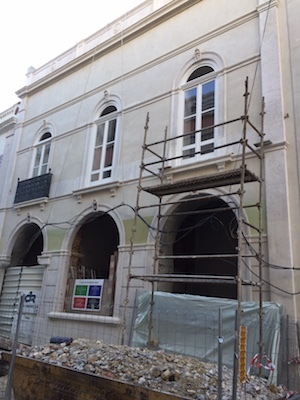 A building under rehabilitation in Bairro Alto in spring 2017. With a high concentration of student bars, Bairro Alto, up the hill from Chiado along the Rua Nova da Trindade and Rua da Misericórdia, has been a party destination for years and is on my list as hipster neighborhood #4. However, the long-abandoned buildings along the main streets have been getting some love lately, and new restaurants have opened to appeal to adventurous tourists, among them Decadente and Independiente, located inside a boutique hotel. This area is home to some of the newest boutique hotels and short-term apartments that promise a more immersive experience that typical chain hotels downtown and in traditional tourist areas. The Miradouro de São Pedro de Alcântara, which divides Bairro Alto from Principe Real, is another lively spot with a great view of Lisbon’s Pombaline center (reconstructed after the 1755 earthquake) and the Castelo de São Jorge. 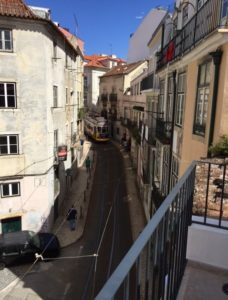 Principe Real, hipster neighborhood #5, has long been a home for expats living in Lisbon, from the British and French in earlier decades, to new arrivals from Brazil, Turkey, and the United States. Upscale restaurants and shopping are the draws of this neighborhood, which blurs the line between entertainment destination and residential area. Along Rua da Escola Politécnica toward the Rato metro station, and again downhill toward the Praça das Flores, one sees more residential areas with local restaurants and shopping and opportunities to meet a combination of native Lisboetas and new arrivals from around the world who now consider Lisbon their home. 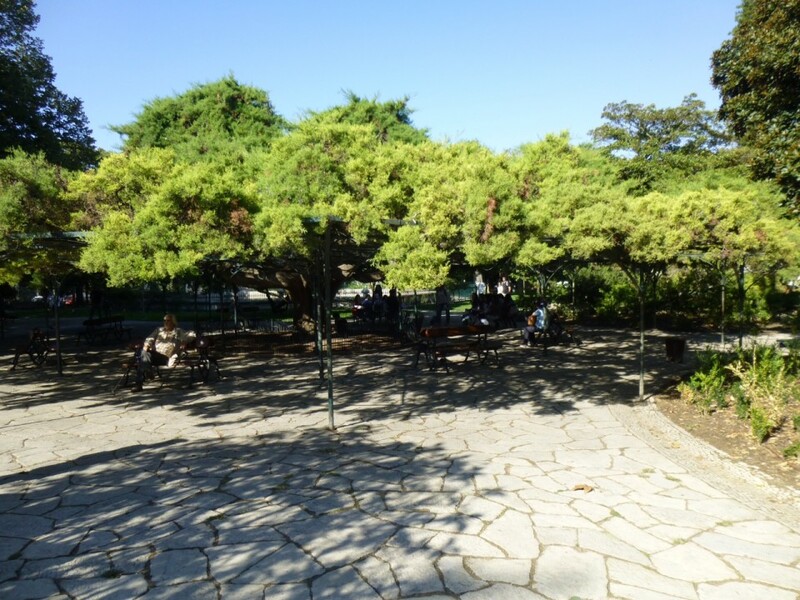 The beloved trees in Principe Real’s main square. A discussion of hipster neighborhoods cannot leave out the LX Factory, a shopping, dining, and entertainment venue beneath the overpass to the 24th of April Bridge. For those familiar with New York City, I’ve compared the LX Factory to DUMBO (Down Under the Manhattan Bridge Overpass) because of the warehouse style of the buildings, the quirky shops and restaurants, and the remoteness from public transportation. Locals drive to the LX Factory, where parking can also be a challenge. We take the bus, and to leave, we basically plan to take the first bus that comes along and figure out a transfer from there (which we can do without paying extra because we buy monthly transit passes). But taxis and rideshares are a good option. 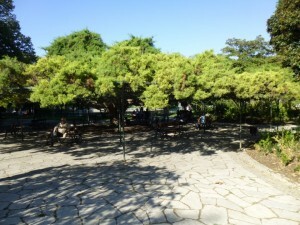 What all these neighborhoods have in common is that they aren’t typical tourist destinations. Yes, many, if not most, of the people you’ll see in the restaurants and bars are visitors, but these are also places with young Portuguese who have benefited from the country’s economic revival also go to have fun. And given the friendliness, curiosity, and English-language abilities of young Portuguese people, these are all great neighborhoods to make new friends and learn about life in Portugal today. Who knows? You may not want to leave! This is an interesting post, Lyn. I have wondered about trendy neighborhoods and how some spots get designated as such. An area close to me is becoming more trendy. More and more specialty coffee shops are taking the place of older stores while niche restaurants are replacing older diners.